I arrived at the cheese counter fully planning to pick up the soft mild blue cheese from Italy called for in the recipe, but after a few minutes of perusing the blue cheese section I made the decision to go local. It wasn’t that difficult with a hunk of Point Reyes original blue cheese staring me down from inside the cheese case. I love Tomales Bay, the coastal fog, the green hills where the Holstein cows graze in harmony with the salty Pacific breezes. The land, it’s all about the land or ‘Terroir’ as the French call it. In fact my favorite French chef who lives in Sonoma says that you should always eat local and I think that’s great advice especially when everything local is so good. I feel very fortunate to live in Northern California where we enjoy an abundance of artisanal cheeses. This week I put my own spin on Dorie’s Gorgonzola-apple quiche recipe by adding local blue cheese, shallots, a sweet tart Gala apple, as well as a handful of walnuts. Once again I used Dorie’s recipe for the quiche dough which always works perfectly for me. 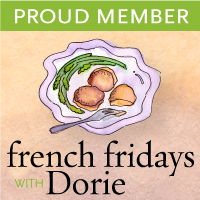 I am a happy camper with my French Fridays with Dorie recipe this week. This rich flavored quiche would be good as an appetizer cut in thin slices and served with bubbles. It may very well knock gougères out of first position in the app department for the time being. Please follow this link to check out all the other quiches this week and I hope you find inspiration in your own backyard. Melt the butter in a small skillet and toss in the shallots, season with salt and pepper. Cook the shallots over medium heat until soft with a light brown color, stir every few minutes for about 10 minutes, set aside. Place the tart shell on the parchment lined baking sheet. Spread the shallots over the bottom of the tart shell. Scatter the apple and walnuts over the shallots. Cover apple mixture with the crumbled blue cheese. In a small bowl beat together the cream and the eggs, season with salt and pepper. Pour the cream mixture into the tart shell. Place in the oven and bake for 35-40 minutes, until the filling is puffed and lightly browned. Remove from the oven and place on a metal rack until cool enough to handle, remove the tart ring and place on a platter to serve. This quiche is making me hungry! You are so lucky to live in the land of happy cows. I hear happy cows come from California. Cheers to you and happy Friday, Patty! Patty, Your quiche looks absolutely scrumptious!! Such beautiful photos! Love that you added the walnuts, I will have to do that next time. Happy Friday!! Delicious! Sounds like a great choice to go local with the blue cheese. This is one of my favorite Dorie recipe to date. Artisanal cheeses are becoming a niche industry here, since there's excellent access to fresh milk. This was a delicious entry to ffwd! That is such a beautiful quiche. Good for you for going local with your ingredients. I always try to when I can. I think the results of your tweaking was a phenomenal triumph! Oh, that is a beauty. Especially sitting on the brown paper with a slice of fruit on top. Up here, cheddar is king; although, an artisnal cheese movement has sprung up in parts of VT and Northern NY. Looks great and I'd go local too if I had such an amazing option! Wonderful post…love the apple slice topping your quiche and I wish I had remembered to add walnuts. Ohhh…la quiche es maravillosa y la combinación perfecta y original,me agrada y deseo un buen trozo,abrazos hugs,hugs. Lovely pictures. It's so nice that you have access to such wonderful local food. Wow, Patty this quiche looks amazing! I am bookmarking this to make for my family. I love Point Rey Blue Cheese – it's not local for me as I live on the East coast but it is some of the best Blue cheese i've found – I discovered it several years ago and it's always a hit with us! Another one I love is the Rogue Creamery Smokey Blue Cheese – if you haven't tried it, Whole Foods carries it and it is fabulous! Thanks for this great recipe! This is beautiful Patty! It's food for my eyes on Friday to end the week. Beautiful, Patty…and shallots were a wonderful idea! Your quiche looks like it came from a bakery. There's nothing like local cheese, and you have so many choices in Northern CA. I'm jealous, though New England has a growing local selection as well. I like the idea of the shallots, nice allium substitution. A really beautiful and delicious quiche. I am HUNGRY now. You just brought the simple quiche to a brand new level; perfection! Your quiche looks beautiful! I like your substitution choice – their cheese is so delicious. I am glad that I tried the gorgonzola dolce for this one though because I have never had it before and prefer it much more to the regular gorgonzola. This tart sounds wonderful! Quebec has a great variety of cheeses (it's our French heritage). I love perusing all the different kinds. Patty, you are so lucky you have so much wonderful local produce and dairy products in Northern California. It's been too long since my last trip there – I should start planning one soon. Gorgeous quiche and descriptions! How delicious! I like the fresh slice of apple as a garnish. You can't go wrong going local, especially when you have such a bountiful selection at your doorstep! This combination sounds wonderful. 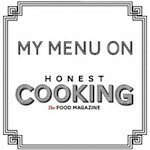 Wonderful enough to get me to dust off my copy of the book to find the recipe. Love the beautiful photos, as always! Mmmmm, this looks delicious! I haven't tried this one yet but I love quiches and Dorie's book. Another gorgeous post from you! Lucky you to be in Northern California with such great opportunities to go local. Our local produce nevers stays in the Coachella Valley, which is sad since it is a major agricultural hub – the farmers make more money shipping it out. When you go to our farmers markets, the produce is trucked in from places almost two hours away. It is a really gorgeous quiche – and now I'm hungry, again! That's a lovely looking quiche you ended up with! Love he addition of walnuts! This is probably one of my favorite dishes of the cookbook so far. All the ingredients just sound so good together. Even better that you used Point Reyes Blue cheese. Love everything about this Quiche. Sorry to have missed your baking day, Patty. Hope to see you soon! Oh Patty, your photos are by far my favourite of this week's FFwD! Using the unbleached parchment paper gives the photo such a rustic element and the green apple lends such a pretty shot of colour. Obviously the star is still the quiche! I agree with you to take advantage of local food as much as possible, especially in Northern California! Although we have many local products here in Québec…we certainly are not as fortunate as you are in your area for sure. By all means, I'm not complaining…I do love my 'Belle Provence'…just wouldn't mind more local goodies. This looks incredible Patty! I love the combination of apples and cheese, really any cheese. Great to hear that you have such a great local cheese selection. I like the thinness of this quiche better than the really thick quiches, it can be too much. I just saw your quiche in Priscilla’s stress-less sides round-up – how delicious, I love these flavors! I saw this over at shescookin – it was so mouthwatering I couldn’t resist coming over to take a look!